Grammar just ain't what it used to be, it seems. When we explained the difference between "fewer" and "less than", following Tesco's policy shift on this matter, readers told us what grammar rules they see being flouted or find confusing. The list was a long one. Here are the best. 1. The one that really annoys me is how people suddenly seem to confuse "have" and "of", as in: "I could of learnt how to write properly." There's no excuse for it! 2. The phrase "for free" is becoming commonplace and is used often on television and it's wrong. It should be "for nothing". 3. That guardian of our language, the BBC, is full of solecisms these days; just one example: 12 pm. There is no such time; "meridiem" as in am ("ante meridiem" means "before noon") and pm ("post meridiem" means "after noon") means midday. The 12th hour is neither before nor after midday. So please, BBC use either midday or noon with midnight the correct term for the other end of the day. This is not being pedantic; in these days of 24-hour days, it is often not readily apparent what time 12 pm might be. 4. If you do something to change a situation, then you "effect" a change. If your circumstances are changed by an action, then the change has caused an "effect". You cannot "affect" a change in something, nor can you be "effected" by one. 5. 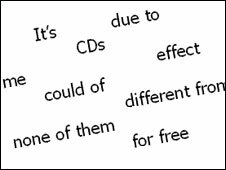 I get annoyed at the reckless use of apostrophes, for example, the plural of CD can't be CD's. 6. Many people, including public speakers, incorrectly use "I" instead of "me". For instance, they would say "She said some very kind things about George and I", thinking that they are being polite or grammatically correct. An easy way to remember which to use is: if you would say him or her on its own, use me; if you would say he or she on its own, use I. For example, "She said some very kind things about him". 7. Incorrect use of reflexives make my blood boil. I think that for someone to say "yourself" and "myself" when they just mean "you" or "me" is possibly out of a false sense of politeness, or maybe the insidious effect of TV soaps, or both. Those who use it correctly can give "themselves" a pat on the back. 8. How about "none of them is" and "none of them are"? Most people would use the latter whereas the former is correct. "None" is short for "not one" therefore "not one (none) of them is" would be used. Most newsreaders still get it right though - on the BBC anyway! NOTE: Fowler's Modern English Usage says that "none" is not short for "not one" and although using a singular verb is more common, using a plural verb has also been an acceptable option since the reign of King Alfred. 9. Similar TO, different FROM, compared WITH. Not "to" used for all of them! NOTE: Fowler's Modern English Usage says: "The commonly expressed view that 'different' should only be followed by 'from' and never by 'to' or 'than' is not supportable in the face of past and present evidence or of logic." It adds that "compare to" is to liken and "compare with" or "compare to" is used to point out similarities and differences. The BBC News website style guide differs with Fowler's on this last point. It says that when pointing out differences, "compare with" should always be used. 10. Here's one they often get wrong on BBC news! BBC reporter: "Then they opened fire on us". This is incorrect. In military terms there are two methods of shooting at an enemy, controlled-fire and open-fire. I.E. you are not opening anything so using the past tense of open is incorrect. The correct expression should be "Then they open-fired on us"
11. I find the increasing, incorrect use of "literally" annoying.... "I literally went blue with anger!!" "Really?" I ask. 13. It annoys me when people use "due to" when they mean "owing to". But then I'm a pedant. NOTE: The BBC News website style guide says "due to" means "caused by" and needs a noun, but "owing to" means "because of" and relates to a verb. Hence, "the visit was cancelled [cancelled is the verb] owing to flooding" is correct. So too is "the flooding [flooding is the noun] was due to weeks of heavy rain". 14. As a secondary teacher, I'm beginning to despair when it comes to "they're", "there" and "their"; not to mention "to", "two" and "too". Why are we so afraid to correct these simple mistakes which make all the difference at a later stage? 15. There is also confusion over lend and borrow. I keep hearing school children asking "to lend your pencil" when what they actually mean is to "borrow" the pencil. 16. I cringe when I hear BBC reporters say "amount of people" when it should be "number of people"! NOTE: Fowler's says "amount" is used with nouns that are not countable, such as "amount of forgiveness" and "amount of glue" - but "number" is used with countable nouns, such as "number of boys" and "number of houses". 17. I don't like it when people say: I can go there "by foot" instead of "on foot"....the right preposition to use is ON. 18. The usage that I find particularly irritating is that of a single noun with a plural verb, for example: "the team are happy with their victory", or "management have congratulated the workforce on the recent increase in productivity". Team is a singular noun so it should read "the team IS happy..." or "the team members ARE happy", the same applies "management HAS congratulated..." Also, what has happened to the word "versus", abbreviated "vs"? Now all we see is "v"; it is even read like that in sports announcements. NOTE: The BBC News website's style is that sports teams and pop/rock bands are always plural. 19. A classic confusing rule is the one that states that one is supposed never to end a sentence with a preposition. While this is easy and appropriate to follow in most cases, for example by saying "Yesterday I visited the town to which she has just moved" instead of "...the town she has just moved to", it becomes troublesome when the verb structure includes a preposition that cannot be removed from it, as in "At work I am using a new computer with which my manager recently set me up", which cannot correctly be changed to "...I am using a new computer up with which my manager recently set me". 20. Stadiums, as a plural of stadium, rather than stadia. NOTE: Fowler's says that when dealing with modern sports grounds, rather than ones from the classical world, the plural is "stadiums".